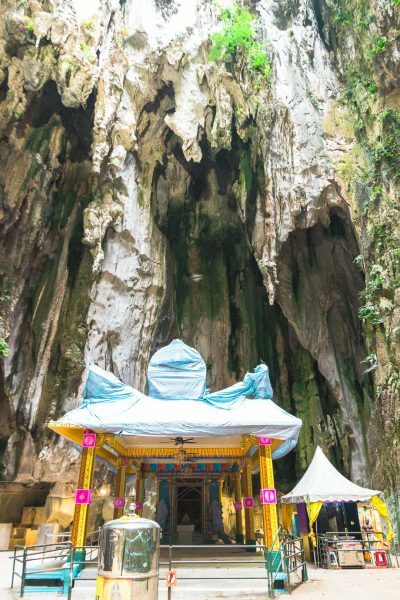 In the North of Kuala Lumpur you can find one of the most unique temple you might have ever seen, a temple located in a cave. The Batu Caves are a place of Hindu worship, and a popular tourist attraction. 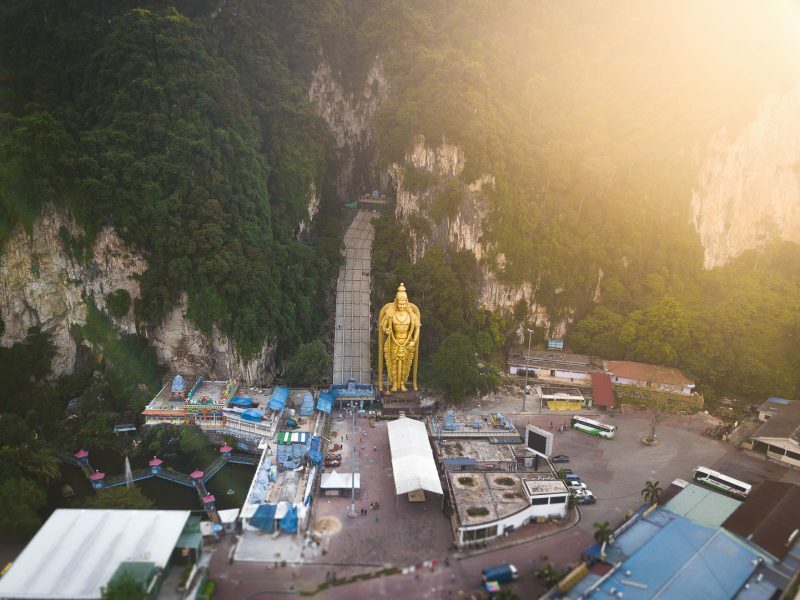 The Batu Caves are one of the most popular Hindu pilgrimage sites, outside of India, and at the Batu Caves the Thaipusam festival in Malaysia is celebrated every year. In 1890 the first statue was installed in the cave, and since 1892 the temple and caves have played an important role in the Thaipusam festival. While the 272 steps were first made of wood, providing access to the caves, they have since been replaced with concrete. The large Murugan statue, located at the entrance of the temple, was built earlier this century over a period of 3 years and was unveiled in 2006. 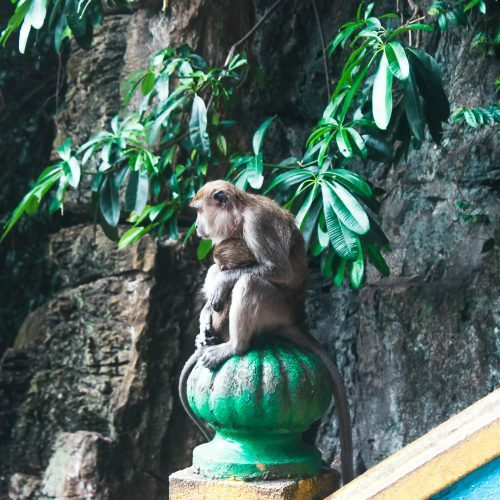 Find out more about the Batu Caves here in this blogpost and why the Batu Caves should be on your Kuala Lumpur itinerary. The Batu Caves are located in the Northern Part of Kuala Lumpur, find a map of the exact location below. The Batu Caves are easily accessible find the two most popular ways to get to the Batu Caves below. Easily combine visiting the Batu Caves with a day of exploring temples in Kuala Lumpur. After, or before, be sure to make a stop at the beautiful Thean Hou Temple as well. Option 1 (budget option) via public transport – Right outside of the Batu Caves there is a train station located where the KMUTER arrives. The KMUTER is a line that runs from KL Sentral station to the North of Kuala Lumpur with the last station being the Batu Caves. Due to current construction on the railways the train only leaves once an hour (with the first train leaving at 6.56am), so it is recommended to check the schedule before heading to KL Sentral. In August 2018 the cost of a train ticket from KL Sentral to the Batu Caves was 2.60MYR one way. The journey from KL Sentral took approximately half an hour. KL Sentral can also easily be reached from multiple lines running through the city. You can use Google Maps to plan your route to KL Sentral from your location. Example cost: Monorail from Bukit Bintang to KL Sentral (2.50MYR), KMUTER to Batu caves (2.60MYR). 5.10MYR per person, one way. Option 2 via Grab – Grab is an app that is kind of like the Uber of Asia. Grab can be used in many countries such as Vietnam, Malaysia and Indonesia and offers a convenient and cheap way to travel in a city. You can download Grab here. Don’t forget you will need internet access on your phone to order a Grab taxi. A Grab car will be able to pick you up at any location within Kuala Lumpur and drop you off in front of the Batu Caves. Example cost: From Bukit Bintang to Batu Caves via Grab taxi 25 – 40 MYR (depending on Grab taxi availability) one way. The cost are not per person but are for the whole grab taxi. Batu Caves Opening hours: The Batu Caves are opened from 6am – 9pm on a daily basis. Please note that religious holidays and events may take place (such as Thaipusam) at the Batu Caves as it is an important pilgrimage site for Hindu’s. 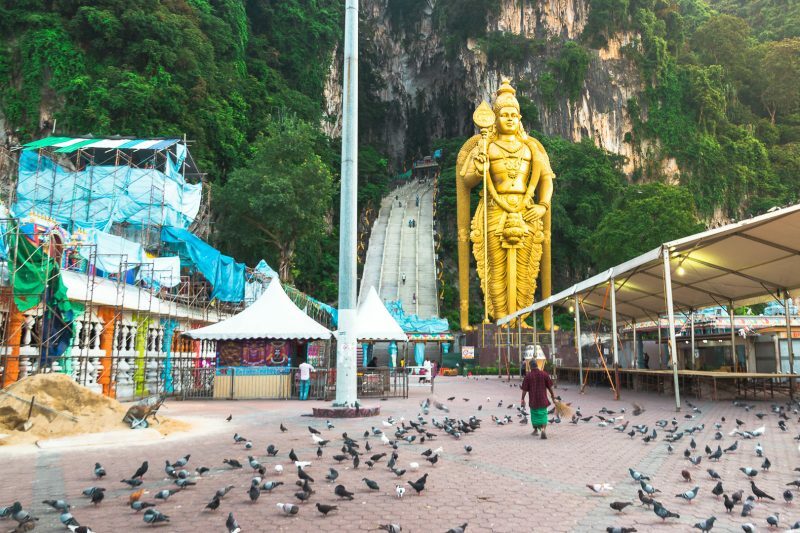 Due to the hot climate of Kuala Lumpur I would recommend visiting the Batu Caves as early in the morning as possible, this will also mean you will beat the large crowd to the temple. Entry fee for the Batu Caves: The cost of accessing the Batu Caves is free. Entering some off the temples requires a ticket to be bought but if you are planning on entering these temples your visit will only be the cost of transportation to get there. 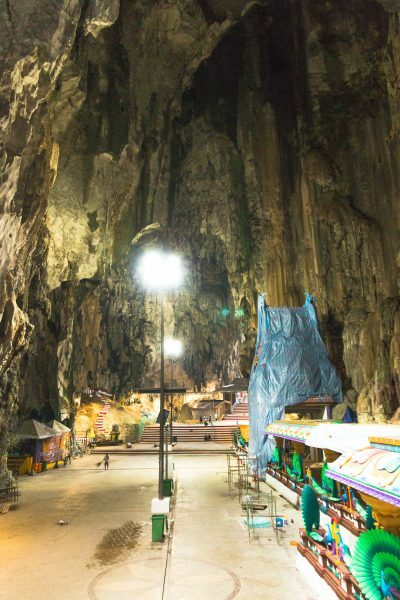 As such visiting the Batu Caves is a great activity if you are traveling Malaysia on a budget! The Dark Cave and Art Gallery Cave both require a ticket to be bought. Batu Caves Dress code: You are expected to dress conservatively at the temple. Which means knees and shoulders should be covered, for both men and women. Sarongs can be rented at the Batu Caves itself, but you will have to pay for this, so might be easier to dress for the occasion. Please note that if you are entering the temple you are also required to take your shoes off. 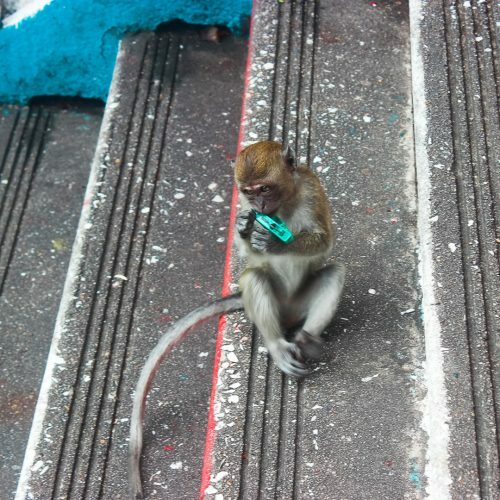 Monkeys at the Batu Caves: The monkeys of the Batu Caves are infamous and known for stealing anything out of your bag or even out of your hand. During the day there are a large amount of monkeys, so please be sure that your bag is closed and your belongings are secure! 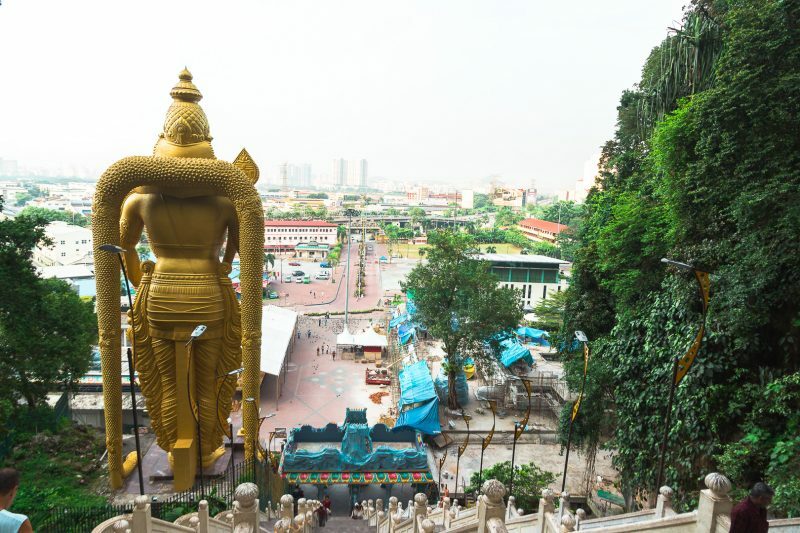 Coming from the train station you will see the large golden Murugan statue, this statue is the largest Mururgan statue in the world and is 42.7m high. On the left hand side you will find the stairs, counting 272 steps, leading to the caves where the temples are located. And yes, as you might have figured out by now you will have to walk up those 272 steps of stairs if you want to see the caves. Once you have climbed the stairs you will have an impressive view over the city and you can walk through the caves, which are well lit, further up the steps to the last cave where another small temple is located. The last time I visited the Batu Caves all the temples were under maintenance/construction, leaving a slight disappointment after reaching the top of the stairs. However, the caves are still quite impressive, that together with the view and the large Murugan statue still made this a worthy visit. Find some photos of my visit below. For the budget travelers and backpackers – I would recommend using Hostelworld.com to find a perfect hostel for you. 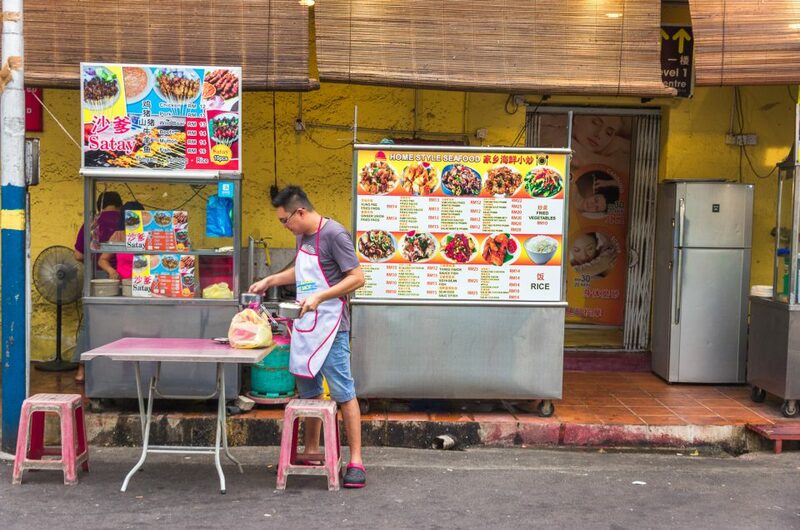 There are a large amount of hostels available in Kuala Lumpur, with most having a prime location for visiting the various sites Kuala Lumpur has to offer. I have personally stayed in Reggae Mansion a couple of times, which I would recommend to any budget traveller or backpackers who likes to party. Large spacious dorm, a cinema and a rooftop bar are all available in this hostel. Check the latest rates and availability for Reggae Mansion here, or click here to have a look at other hostels in Kuala Lumpur! 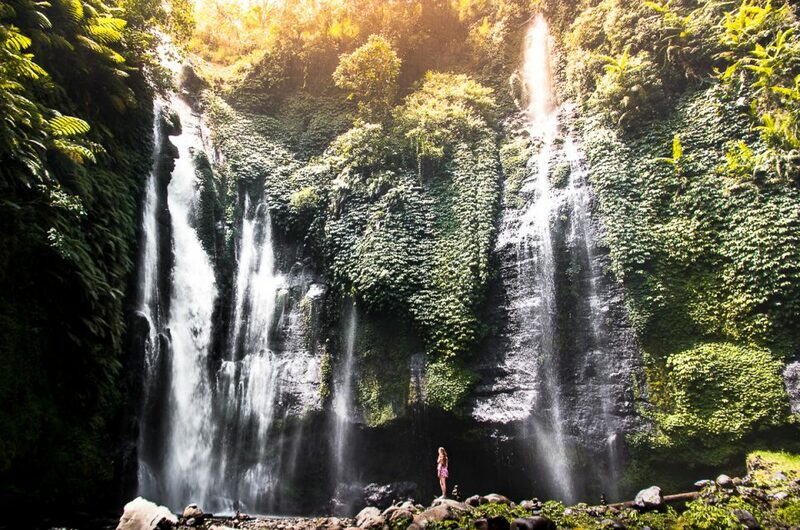 For any type of traveller – I have used AirBnB in multiple countries and have never been disappointed. Easy to book, to communicate and you often get a lot more for a lower price. We stayed at this AirBnB in Kuala Lumpur and got the same amenities as a hotel (gym and pool) for the price of a mid range hotel. And to make it even better, if you sign up here now for AirBnB you will get a 30$ discount on your first booking, sign up now here and get the credit before it is too late! For the big spenders and luxury seekers – I would personally recommend using Booking.com or Agoda.com to find the best deals. They both offer a large variety of (luxury) hotels in Kuala Lumpur. Most luxury hotels have a prima location in the city with breakfast included, access to gyms, pool and some even have a rooftop bar with a spectacular view. The Traders Hotel and The Grand Hyatt are both in close proximity of the Petronas Twin Towers, offering a spectacular view at day and night. 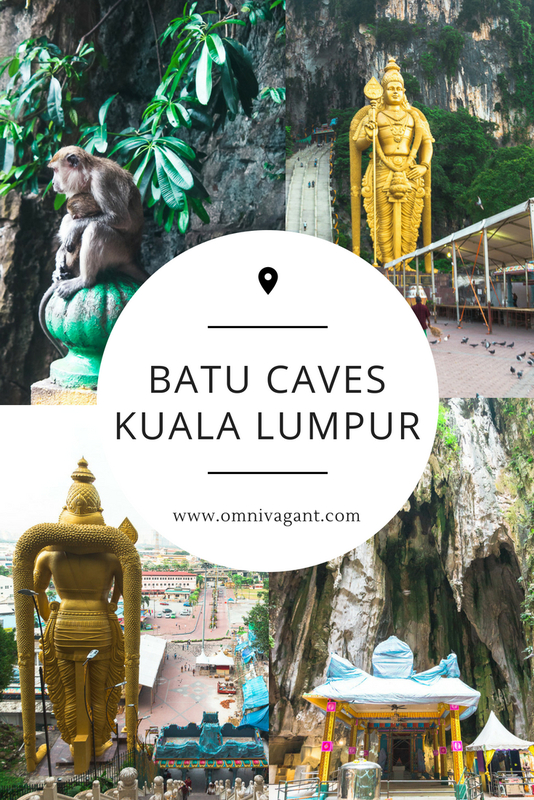 I hope you all enjoyed this post about the Batu Caves and now have it written down on your Kuala Lumpur Bucket List. If you are traveling Peninsular Malaysia don’t forget to check out our other articles on Malaysia here! Should you have any further questions do not hesitate to drop a comment down below! I have seen a lot of pictures of this place and I would like to visit one day. Seems like you visited early morning? I am used to seeing photos with a lot of people around. Also, how did you take the first photo (where the stature is seen from above)? It is very cool! Hi Ruth! Thanks for your comment. Yes, we took the first train there, arrived at 7.30am in the morning, such a great experience. We took a drone with us to take photos from higher up!